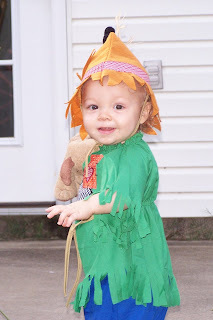 Our Little Miracles: Happy Halloween! 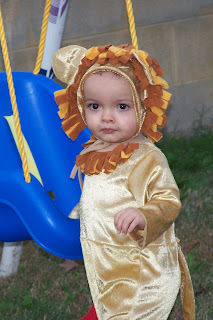 This year we had a lion and a scarecrow for Halloween. 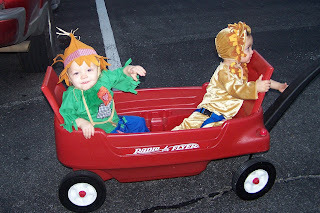 We went to the Fall Festival at church and the boys seemed to have fun watching everyone and riding around in their wagon. Although it was somewhat difficult to maneuver, I was so glad I didn't have to chase two boys around! The boys got to get candy in their bags, but didn't quite know what to do with it (that is okay, Mommy and Daddy know :)). 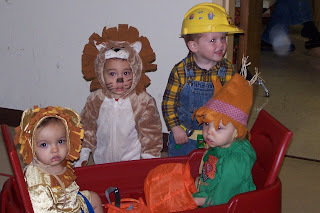 They did really good keeping their costumes in place, until the end and they both wanted their hats off. 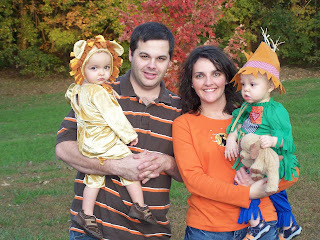 When we got home, we decided to go to Mr. Darrell and Mrs. Deanna's house across the road to trick or treat. They gave the boys some good candy. After that, the boys were ready to head home and get ready for bed. All in all, it was a good night. Here are some pics. Here we all are in our back yard. It is hard to get everyone looking at the camera at the same time. Here are the boys playing in the back yard before we left for the Fall Festival. Carson REALLY wanted to swing. We are about to go inside to the Fall Festival! Once we got inside, we saw lots of people. Here are some of our friends. Oh, how cute!!! 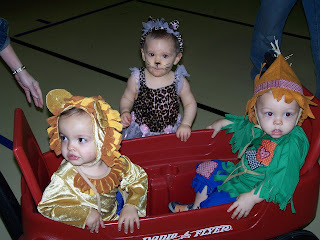 I love their costumes, what a wonderful idea. What big boys they are! Trust me, next year they will know exactly what to do w/ that candy! Christie - is that Rylan Jones with the boys in the last pic? He goes to school with Aaron!